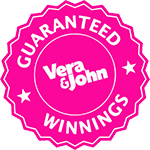 Having been established in 2011, the casino with a cozy name Vera&John has a lot to offer to the pickiest players. Basically, they have one of the hugest game collections in the area, a generous welcome bonus, and the information on the website which will help you to sort out all the issues. Oh yes, they also have friendly customer support working until midnight. To know more about the perks and drawbacks of that cozy virtual place you can check our Vera&John Casino review. To have such a collection of games as Vera&John, a casino must do its best and find the richest software developers. And they found a range of providers where you can find the whales of the industry such as Microgaming, Evolution Gaming, Betsoft, NetEnt, Play'n GO, the same as fresh brands which are Pragmatic Play, Yggdrasil Gaming, Leander Games, Quickspin, Thunderkick. That’s not everything they offer. You can check for the games in the search. You can search by game name or provider, or alphabet. In case you have some beloved games, you can check the various categories made especially for the precise choice. See the following list: Life changers, Big wins, Recent hits, VJ favorites, Brand new, Greatest hits, Promoted, All games, Hot wins, Jackpots, Classic slots, Star-studded, Roulette, Blackjack, Live casino, Table games, Scratch games, Catch of the day, and it is not all of them! The welcome bonus at the casino is really welcoming! It has two stages, where you get the bonus! With the first bonus, you get 200% bonus up to €50. And 100 free spins will come just after! Moreover, the pleasure is prolonged for the next 9 days. You get 10 spins straight away, and for the next days, you get 10 spins per day. With the second deposit, you get 100% bonus up to €50, and the same 100 bonuses for 10 days. All in all, you get a cool start budget to catch a big fish. The mobile version is handy, and you can easily get to it. You don’t have to download anything. The mobile version is already adapted for mobiles. When the player goes to the website via smartphone or tablet, it automatically directs him/her to the mobile extensions. So, you just log in and start playing. Now your favorite casino can be with you when you are in Tibet or Peru, or whatever. The only thing you will have to take care of is the stable internet connection. There are a couple of protection methods which have proven to be good for the online casinos through the years. Vera and John use them to make the players feel safe and protected. Vera and John decided to have 256-bit SSL encryption and firewall protection to make sure all the data are safe. You can be sure your data are in the safe hands, and the only thing you can worry about is the best winning! For the comfortable withdrawal of your winnings, the casino got the most popular payment systems: Visa Electron, Neteller, Skrill, Visa, Trustly, Bank Wire Transfer. Usually, we check reviews to see the real casino reputation, as we trust only the experienced ones. The casino portals say Vera and John love the players. You can see it from this generous collection of games which they are continually renewing them to keep guests entertained. Payouts proceed on time, and the payment systems react instantly. And the essential thing, customer support, is working every day from 8 AM till 00:00 in three channels. There are a live chat, an email, and a phone line in case you like to talk about some issues. All in all, the casino seems friendly and welcoming to answer every question. We came, we saw, we passed the information to you. We can assume the Vera&John casino is worth your attention. Firstly, because they made their game selection rich and beautiful. Secondly, they have the nice mobile version and helpful customer support. And thirdly, they do work to make you have as much fun as possible! We sincerely wish you good luck!